OCHOPEE, Fla. (AP) — Officials at a South Florida wildlife preserve say they've captured the largest python ever found in the park. PHOENIX (AP) — Former Maricopa County Sheriff Joe Arpaio says his wife is home after being hospitalized for a rattlesnake bite. PHOENIX (AP) — The wife of former Maricopa County Sheriff Joe Arpaio is recovering from a rattlesnake bite. HARRISBURG, Ill. (AP) — A stretch of road in southern Illinois is closed to allow snakes and amphibians the chance to migrate to their summer homes. FALLS TOWNSHIP, Pa. (AP) — Police in Pennsylvania have encountered a slithery situation. JACKSONVILLE BEACH, Fla. (AP) — A rattlesnake in Florida ended up in the back of a police car. The snake was being carried by a homeless man walking around Jacksonville Beach on Monday morning. Sgt. Larry Smith told local news stations the snake was 6 to 8 feet (2 to 2.5 meters) long. When police stopped the man, they told him to throw the reptile into the back of their vehicle for safety. Police in Indonesia's easternmost Papua region apologized but also attempted to justify the officers' actions by saying the snake was not venomous and that they hadn't resorted to beating the man, who was suspected of theft. AUSTIN, Texas (AP) — Some rattlesnakes have slithered through parts of the Texas Capitol to help promote an upcoming reptile roundup. Members of the Sweetwater Jaycees were in Austin on Tuesday to support what's billed as the World's Largest Rattlesnake Roundup. This year's event includes a parade and a Miss Snake Charmer pageant on March 7. Other rattlesnake-related activities run through March 10. FORT LAUDERDALE, Fla. (AP) — An 18-year-old Florida man is accused of illegally keeping venomous snakes in a bedroom closet at his Fort Lauderdale home. SEATTLE (AP) — Officials at the zoo in Seattle have taken in 250 tarantula spiderlings that were confiscated by the U.S. Fish and Wildlife Service from an importer. Woodland Park Zoo officials on Friday invited media to photograph the spiders as well as exotic reptiles including Gila monsters that were taken in recently after a woman in southern Washington died. KAILUA-KONA, Hawaii (AP) — The Hawaii Department of Agriculture is importing four brown tree snakes to be used to train dogs to detect the dangerously invasive species and hopefully prevent the snakes from establishing themselves in the islands. CONROE, Texas (AP) — Firefighters in Texas have rescued more than 100 snakes from a home that caught fire over the weekend. Authorities say a Christmas tree may have sparked the blaze Saturday near Conroe, about 40 miles (65 kilometers) north of Houston. The snakes included pythons and boa constrictors. Authorities say that when firefighters arrived, they discovered a second-floor bedroom full of snakes and lizards. GREAT BEND, Kan. (AP) — Great Bend police who responded to reports that a man was bitten by a venomous snake allegedly found the snake decapitated and hallucinogenic mushrooms at his home. The department says on a Facebook post that officers went to the home of 25-year-old Ari Hooley on Tuesday after he was treated Monday for bite from a Coral Cobra, a venomous snake. It is illegal to own an exotic or venomous snake in Great Bend. WAYNESBORO, Va. (AP) — A wildlife expert says a rare, two-headed snake found several months ago in Virginia near the nation's capital has died. FRANKFORT, Ky. (AP) — A rare, two-headed copperhead snake is on display at the Salato Wildlife Education Center in Frankfort. The center says the snake will be shown to the public until Nov. 21, when it closes for the winter. The snake is only a month old and is on display from 10 a.m to 4 p.m every Tuesday through Saturday. The center closes seasonally each year to allow the staff to maintain and update exhibits and facilities. ALLENTOWN, Pa. (AP) — The sight of humane officers carrying dozens of tropical birds, a 14-foot boa constrictor, rabbits and rats from a Macungie home recently seemed shocking, if not bizarre. And when officers removed more snakes, as well as skunks, ferrets, alligators and giant tortoises from a Montgomery County home a few days later, the scene bordered on the surreal. MIAMI (AP) — Fueled by bountiful swamps that provide a steady supply of marsh rabbits, deer, wading birds and other meals, Burmese pythons in Florida have rapidly adapted to become hardier and more resistant to cold than their Asian cousins, a new study has found. And that supercharged evolution should serve as a warning not just for Florida, but the entire U.S.
HARRISBURG, Ill. (AP) — Snakes and amphibians that have not yet crossed Snake Road in Shawnee National Forest can relax because officials are giving them a little more time to make the trek. CADIZ, Ohio (AP) — A nearly 5-foot-long rattlesnake has been found in eastern Ohio well north of its normal habitat. The Times Reporter reports wildlife officials recently learned that a timber rattlesnake had been run over on U.S. Route 250. The 57-inch-long (145-centimeter) snake was found dead near Tappan Lake in Harrison County. NEW ORLEANS (AP) — A Louisiana professor is in heady company, honored by having one of three newly identified species of snakes from the Galapagos Islands named after him. FRANKFORT, Ky. (AP) — A Kentucky wildlife center says it plans to display a rare find: a two-headed copperhead. A statement from the Department of Fish and Wildlife says the Salato Wildlife Education Center in Frankfort will exhibit the snake for the public, barring any complications in the reptile's health, after Thursday. Officials say a Leslie County couple donated the snake to the facility for educational purposes after finding it in their yard this month. LOGAN, Utah (AP) — Authorities say a small python that was found in a Logan neighborhood was positively identified by his owners after it was allegedly stolen from their home earlier this summer. CANBERRA, Australia (AP) — A British fisherman was bitten by a sea snake while working on a trawler off the northern Australian coast and died before a rescue helicopter could reach him, officials said Friday. The 23-year-old man, who has not been identified, was bitten Thursday as he was pulling in a net in a remote part the Northern Territory coast, a police statement said. Sea snakes are highly venomous but are not aggressive, so humans are rarely bitten by them in Australian waters. INDIANAPOLIS (AP) — An African snake that's considered one of the world's deadliest snakes will be slithering into the Indianapolis Zoo next year. FORT LAUDERDALE, Fla. (AP) — Yellow anaconda snakes, mongooses and bush-tail possums could soon be officially banned in Florida. Those animals were among more than a dozen unwelcome species the Florida Fish and Wildlife Conservation Commission agreed to ban on Thursday under a proposed plan to stop the spread of non-native predators. SIOUX FALLS, S.D. (AP) — No one was injured when a boa constrictor somehow escaped from a Sioux Falls store and slithered into a nearby laundry business. Officers responded to the laundry Tuesday night. Police spokesman Sam Clemens says the snake was captured and taken to the Sioux Falls Humane Society. It wasn't clear how big the snake was, but police records indicate an officer tussled with it. HAMDEN, Conn. (AP) — A Connecticut man trying to be a friend to the environment when he picked up a bag of trash got a dangerous surprise. Police in Hamden say the man threw the bag into a trash can at his home, and the next day found a venomous copperhead snake in the can. Assistant Animal Control Officer Mitch Gibbs said in a statement Tuesday the man is a frequent visitor West Rock Ridge State Park. WAYNESBORO, Va. (AP) — A wildlife and conservation research hospital says a two-headed snake recently found near the nation's capital may be sent to an educational facility. The Wildlife Center of Virginia says the two-headed Eastern Copperhead was found in a northern Virginia neighborhood last week. It says a state herpetologist brought the snake to the hospital Thursday for an examination. 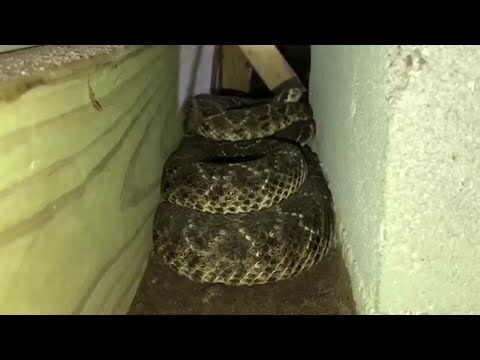 SAN ANTONIO (AP) — Animal control officials have removed more than 100 snakes and more than 400 rodents from a San Antonio home following concerns about the animals' living conditions. GREELEY, Colo. (AP) — When Stephen Mackessy opened the door to one of his favorite rooms on the University of Northern Colorado campus, it erupted with a noise like a mix of cicadas buzzing, rain hitting a metal roof and raucous applause after a concert. It's enough to make many people nervous, even Mackessy's graduate students, especially when they see what made the noise. HARRISBURG, Ill. (AP) — Snakes and amphibians will have the right away for a while on Shawnee National Forest's Snake Road. BRAINTREE, Mass. (AP) — Police responding to a Massachusetts go-kart track found a venomous snake wrapped around a tree in the parking lot. Braintree police say the timber rattlesnake was discovered Wednesday night near X1 Boston. Experts think the rattlesnake likely came from the nearby 6,000-acre Blue Hills Reservation, which has a known rattlesnake population. ALBUQUERQUE, N.M. (AP) — Environmentalists are threatening to sue the U.S. government in an effort to set aside hundreds of square miles of habitat they say is necessary for the survival of the northern Mexican garter snake and the narrow-headed garter snake. Once found in Arizona, New Mexico and parts of Mexico, biologists say the snakes have been limited to isolated populations due to nonnative species and the loss and degradation of their riverside habitats. OVERLAND PARK, Kan. (AP) — Rain, snow, sleet, even barking dogs are fine, but a Kansas postal worker had to draw the line when he found a red tail boa constrictor draped over a mailbox. The Kansas City Star reports that the letter carrier was delivering mail Friday in Overland Park, a Kansas City suburb. The huge snake was on the mailbox on the front porch. CONCORD, N.H. (AP) — Scene-stealing snakes, bears, turkeys and lobsters all make an appearance in the latest season of a television program featuring New Hampshire's Fish and Game conservation officers. "North Woods Law" returns to the Animal Planet cable network on Sunday at 9 p.m.
STOUGHTON, Mass. (AP) — Woah, it's a boa! One Massachusetts resident popped their car hood to check fluids to find a boa constrictor staring right back.